Her most recent questionable action came when she recently denied a request by 17-year-old Kiran Matharu to attend the LPGA’s Q School, which starts on the 19th. What the heck is Duramed anyway? Ah wait, that's branding because I asked what Duramed is! God she's good. Of all the Q School applicants this year, Matharu might actually be among the most qualified. She’s the reigning Ladies English Amateur champion, was a member of Great Britain and Ireland’s Curtis Cup team that competed last month at Bandon Dunes, and placed 15th in her first professional event. In addition, the young Englishwoman is a two-time Faldo Series Girls champion. Yorkshire-born Matharu started golf at the age of 11 and has been an outstanding player ever since. 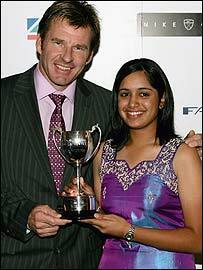 She’s the only British Asian female golfer, has an engaging personality and was named twice as Leeds Sports Performer of the Year – in 2003 and 2004. Earlier this year she was named “Female Junior Sports Personality of the Year” at the Sony Entertainment Television Sports Personality of the Year awards for British Asians. After the Curtis Cup, Matharu turned professional with a plus-4 handicap, the lowest of any female golfer in the UK. She made the cut and finished 15th in The Wales Ladies Championship, her first professional tournament.